I promised another post on Ukraine, and after the warm welcome I was given in Oxford, there may well be more. My on-going correspondence with translator Steve Komarnyckyj (right, in photo) has evolved into conversations with his partner S.J. 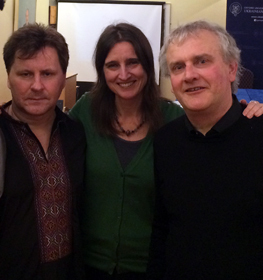 Speight, with whom he runs Kalyna Language Press; and, in Ukraine, poet Ihor Pavlyuk (left, in photo) and his wife Lyudmyla Pavlyuk, herself a professor of journalism, so there is plenty to share. Today I’ll give some brief impressions of Ihor’s poetry and, at her request, reproduce a political article by Lyudmyla, published yesterday by The Wilson Centre. I am already convinced of her central point that the invasion of Crimea must cause the world to look very differently at Russia, and I was struck by her argument that Russia should pay reparation for its crime there. Like boycott, reparation is a non-violent response to geopolitical injustice that could stand to be strengthened in international law. You were so wanton, loving anguish, / The recesses of night. // The end of the tunnel is the end of a gun barrel, / The edge of the sea, the beginning of our country. I will leave you there, with the promise of rebirth, a Chekhovian echo, and the tidbit of knowledge that Chekhov had Ukrainian blood through his grandmother – a symbol of cultural interfusion complicated by the image of the Russian writer’s dilapidated house in Yalta, a museum that fell into disrepair due to a conflict over whether Russia or the cash-strapped Crimean government should pay for its upkeep. That tension between neighbourly friendship and political emnity is just one topic of discussion in this recording of the English PEN London event on March 5th 2014, readings, talk and an exquisite opening performance by singer Olesya Zdorovetska. If your interest is piqued by Ihor’s poems, I urge you to listen. Why was Ukraine so powerless in the occupation and annexation of Crimea? Ukrainians themselves have to find the answers to this question in order to find solutions to the occupation of the peninsula. The comments below discuss the reasons for Ukraine’s vulnerability in its relations with Russia and also examine the ways in which Ukraine should strengthen its sovereignty and ability to protect its statehood. The economy is one step from the abyss. Ukraine’s helpless response to Russia’s swift annexation of Crimea originates, first of all, with the nation’s eviscerated economy. For more than two decades since its independence, Ukraine was weakened by massive institutional corruption that swept away resources. Recently, police discovered gold bars and nearly $5 million in the apartment of former Energy and Coal Industry Minister Eduard Stavitsky, just one of hundreds who worked in high level government positions without any care for state interests. It is not possible for a country to strengthen its army while receiving credit for debt repayments that officials then redirect to their personal accounts. Army hardware, including tanks and planes, had also been the object of murky, or entirely illegal, trade for many years – and some state officials “replenished” their own accounts with the costs, not the funds, for the army’s equipment. The fifth column. Multiple conscious and subversive efforts have been carried out by Russia to weaken the Ukrainian army. They were patriots, but not Ukrainian patriots – they worked for Russia. According to the Ukrainian constitution, the president is Commander-in-Chief, but under Former President Viktor Yanukovych, pro-Russian assimilation and erosion of the Ukrainian Armed Forces was not to be punished. This mood of submissiveness to Russian orders and structures was cultivated for years and ultimately worked against Ukraine’s sovereignty, shattered discipline, and enabled the rapid rebranding of a large number of Ukrainian soldiers into Crimean-Russian military units. Top commanders and people in charge of military and security forces are having new Russian passports or Ukrainian documents made. Yanukovcyh himself fled to Russia and requested Russia’s intervention in Ukraine. The former Minister of Defense Lebedev also fled to Russia. Conjoined identities. As there was no guarded border between Ukraine and Russia, there was no distinctive demarcation between the two nations’ cultural identities. Intercultural ties and the abundance of Russian movies and TV shows for Ukrainian audiences transmitted a message: “if you want to be a winner, join us.” Dangerous trends start when the implications of cultural “sameness” extend to politics and security. Some Ukrainian military commanders recently revealed to the public that during the past 22 years of Ukrainian independence, Russia had not been regarded as a “potential enemy” in military training scenarios, nor in operation strategies. The neighbor’s double betrayal. We Ukrainians were careless because we did not feel we were in danger. It is only now that we understand that trust is a version of idealism and any kind of idealism is punishable. The scale of challenge that Ukraine faced in Crimea really exceeded anything that Ukrainians could have imagined in regard to its “brotherly nation.” Even those suspicious of the “brother nation” and “brotherly” rhetoric believed in the obligatory power of international law and multilateral agreements. Russia betrayed its neighbor’s trust and violated a treaty, the 1994 Budapest Memorandum, which guaranteed the young Ukrainian state’s security and sovereignty in exchange for handing over its nuclear weapons. It showed everyone that the entire construction of this agreement was inherently false and that the brutal behavior of the aggressor canceled all the assumed implications of Russia’s “protecting” and “missionary” role. Not only Ukraine, but the world should have taken pause to deal with this. Military campaign vs. electoral campaign. Ukraine was caught off guard during a serious, total, and temporary reload of power. Many accused the new Ukrainian power of acting too slow with appointing new government positions. It is probably partly true that some unnecessary emotions and ambitions of different groups accompanying that process contributed in the general indecisive mood concerning defensive operations in Crimea. Yet the most peculiar point of the entire “reload the matrix” situation was that Ukraine could not afford to declare war because this would have interfered with elections and allowing the people to choose a legitimate government. Russia took advantage of this moment when Ukraine needed peace by waging war. Russia’s continuing parade of its military near Ukraine’s border serves as a pretext to potentially interrupt the campaign and cancel the elections. That is why the remaining period, until the end of May, is a time of high probability for military action or provocations against Ukraine and a heightened threat to its national security. International support. Given the tense situation, Ukraine needed serious international support, and while planning its response it had to comply with the scale and quality of outside assistance. The most assuring message to Ukraine from the global community was the promise of major international players, including the guarantors of the Budapest Memorandum, that they would not abandon Ukraine. While all the necessary words were voiced, potential supporters had to take time to consider their options and decide how to help. Instead of Russia’s barbaric aggression, the international community proposed a “banks instead of tanks” strategy. Ukraine had no choice but to behave accordingly to its protectors’ strategy, resulting in the “postponement” of decisive actions regarding occupied Crimea. Just like the western countries, Ukraine is now relying more on diplomacy and economic sanctions, which is a far less impressive means in dealing with the aggressor, as a safe option that will hopefully yield results. The monkey’s grenade is an atomic one. The Russian imperial brain is completely inflamed, causing both Ukraine and its potential supporters to react carefully. Not only has Russia fortified Crimea with an anti-missile complex and aircraft carriers, it asymmetrically declared through its main ideologues and geopolititical strategists, including television personality Dmitry Kiselov, that it cannot promise control over its nuclear button and reminded everyone that Russia could easily turn the United States into ashes. Under Putin’s control, no TV message is accidental. The Ukrainian people understand the significance of giving up territory and no military’s dignity allows it. Occupied Crimea is a tragedy for millions in Ukraine. But a serious war would be an even more tangible trauma and tragedy. The Dalai Lama way. In the case of Crimea, Ukraine had to be careful not to put millions of people’s lives at risk. There was a danger for Ukraine in fighting with Russia not only because of high risks for civilians, but also because of the likelihood of Ukraine being portrayed as a perpetrator, not a victim. During the 2008 Russia-Georgia war, many remember how Russia presented Georgia as a wrongdoer, guilty of repressions against the local population, while “peace-loving” Russia was right there to save them. Then confident peacekeeper, Nicholas Sarkozi, arrived at the conflict zone and in a blink of an eye, 20% of Georgian territory was carved out. The same result was achieved in Crimea without bloodshed. Given the huge pro-Russian bias that lives in the minds of many politicians and average people in the world, Ukraine could not have afforded any wrong move. Nobody can say now that Ukraine allowed or provoked mass killings. Instead, everyone can witness the scale of Russia’s violations of international law. During the Crimean events, Ukraine has been punished for being weak and powerless; it is now Russia’s turn to be punished for being the aggressor and an occupier. Respect for international laws vs. pro-Russian bias. Nobody in Ukraine doubts that Crimea should be returned to Ukraine. The overwhelming majority of Ukrainians are ready to support the autonomy of the Crimean Tatars with the maximum rights for the indigenous nation. This determination is not motivated by ethnocentric ambitions and emotions, but within the context that Russia violated Ukrainian and international law. Since this is a crime, it cannot be forgiven just because Sergey Lavrov and Vladimir Putin hysterically cry about their post-Soviet complexes. Samantha Power provided convincing arguments to understanding the legal ground of the situation in Crimea after the “referendum.” She insisted that the national and internationals status of the territory has not changed: “A thief can steal property but that does not confer the right of ownership on the thief.” The only thing that is needed now on the part of the world community is the coherence and persistence in following this principle. A pro-Russian bias in international relations is the a priori belief that Russia can “protect” Ukraine, that Russia, not Ukraine, should decide whether Ukraine should be in NATO, that Russia has veto power in the UN, and that Russia should be a member of a group that controls countries that are close to creating atomic weapons. How can a bandit, even if he is a former police officer, join a police force and chase criminals after he was accused of robbing and intrusion? It’s not possible in the case of the officer, and it should not be possible in the case of the Russian Federation. Security for Ukraine, security for the world. The occupation of Crimea is eye-opening for both Ukraine and the world. This action destroyed all illusions concerning the previously assumed human and humanitarian reasons for Russia’s involvement in global affairs. By its behavior, the Russian Federation proved that its status of a “guarantor” was merely a disguise for its real intentions to keep Ukraine in its orbit. Since the first days of its rule over Crimea, Russia has revealed an objective to turn the peninsula into a military base and a network of military plants. Russia has not suffered because of the West or NATO, whereas Ukraine has already become an object and victim of Russia’s aggression. NATO should ask Ukraine, not Russia, if Ukraine has plans to join NATO. The former “guarantees” did not work; therefore, Ukraine must do its best to join NATO as the only real way for Ukraine to have security guarantees and real protection. Russia has awakened Ukraine and forced a peaceful neighbor toward militarization, a totally different mode of life compared to Ukraine’s former focus on civil tasks. Ukraine has to modernize its army since now it is forced to keep pace with Russia’s armament race. Accordingly, the world should make serious amendments to the perception of the “Russian factor.” Putin has already created a huge military potential that is being modernized, and the target is indicated – Ukraine or anyone who offends the idea of the world according to Russia. This entry was posted in Book Reviews, Poetry, Ukraine and tagged Crimea, Ihor Pavlyuk, Kalyna Language Press, Lyudmyla Pavlyuk, S.J. Speight, Steve Komarnyckyj, Ukraine. Bookmark the permalink.